Matthew Apgar - mapgar@shawmedia.com Leticia Castaon of Woodstock speaks during a class at McHenry County College on Wednesday, June 17, 2015 in Crystal Lake. 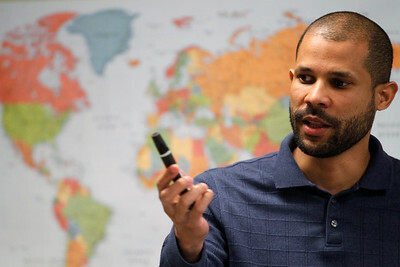 Matthew Apgar - mapgar@shawmedia.com Julio Capeles of Crystal Lake, coordinator of adult education instruction, talks to his GED class at McHenry County College on Wednesday, June 17, 2015 in Crystal Lake. Matthew Apgar - mapgar@shawmedia.com Julio Capeles of Crystal Lake, coordinator of adult education instruction, helps Antonio Tapio, left, and Aidez Moreno access their computers during his GED class at McHenry County College on Wednesday, June 17, 2015 in Crystal Lake. Matthew Apgar - mapgar@shawmedia.com Julio Capeles of Crystal Lake, coordinator of adult education instruction, helps Eduardo Godiuez with his computer during a GED class at McHenry County College on Wednesday, June 17, 2015 in Crystal Lake. 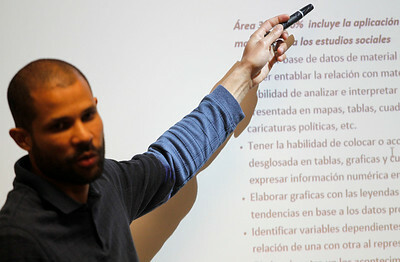 Matthew Apgar - mapgar@shawmedia.com Julio Capeles of Crystal Lake, coordinator of adult education instruction, teaches during his GED class at McHenry County College on Wednesday, June 17, 2015 in Crystal Lake. Matthew Apgar - mapgar@shawmedia.com Zaida Rivas, center, helps Eduardo Godiuez with his computer during a GED class at McHenry County College on Wednesday, June 17, 2015 in Crystal Lake. 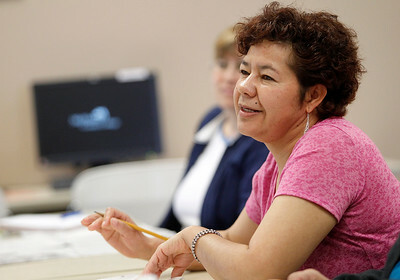 Zaida Rivas, center, helps Eduardo Godiuez with his computer during a GED class at McHenry County College on Wednesday, June 17, 2015 in Crystal Lake.